Location: Castledermot, County Kildare, Northern Ireland. Notes: Kilkea Castle is located 5 km (3.1 mi) northwest of Castledermot, County Kildare, Ireland near the village of Kilkea on the R418 regional road from Athy to Tullow. It was a medieval stronghold of the Fitzgeralds, earls of Kildare.Sir Walter de Riddlesford built a motte and bailey castle there in 1181. A grand daughter of his married Maurice Fitzgerald, 3rd baron of Offaly, and so the Manor of Kilkea came into the possession of the Fitzgeralds and was to remain in the family for over 700 years. 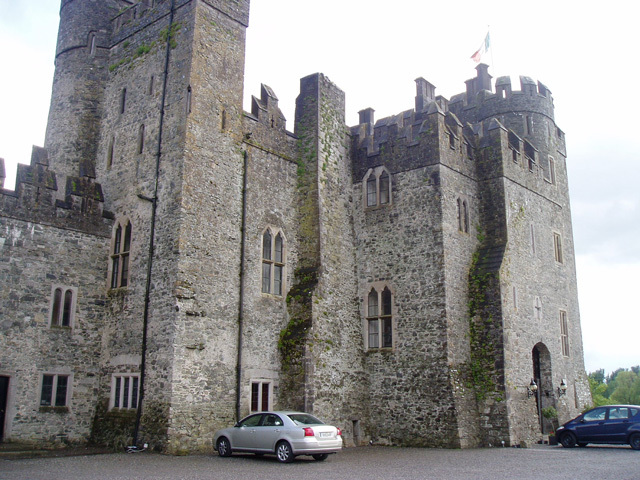 Sir Thomas de Rokeby, the Justiciar of Ireland, used the castle as his military base, and died here in 1356. The castle is particularly, associated with Gerald, the 11th Earl of Kildare known as the "Wizard Earl", who became the male representative of the Geraldines when only twelve years of age after his half brother "Silken Thomas" the 10th earl, was executed at Tyburn in 1537. The "Wizard Earl" was sent to the continent to be educated, and following his return to Kildare his interest in alchemy caused much interest among his neighbours around Kilkea Castle and he was said to possess magic powers.The Earl died in 1585 and is supposed to return to the castle every seventh year mounted on a silver-shod white charger. In 1634 the castle was leased to the Jesuit Order by the widow of the 14th Earl of Kildare and they remained there until 1646. That year the order entertained the Archbishop Rinuccini, Papal Nuncio to the Confederation of Kilkenny at Kilkea. In the early eighteenth century the 19th Earl of Kildare decided to make Carton House the family seat and Kilkea Castle was leased to a succession of tenants. One of these tenants was Thomas Reynolds, a Dublin silk merchant, who was a "friend" of the Kildare hero of 1798, Lord Edward FitzGerald, through whom Reynolds had become a United Irishman, only to become an informer. His role as informer did not prevent the castle which had been recently done up in fine style being sacked by military during the rebellion. After a fire in 1849 the 3rd Duke of Leinster, Lord Walter was a founder member of the Kildare Archaeological Society in 1891 and undoubtedly the greatest antiquarian Kildare has ever had. He was editor of the "Journals of the Association of the Preservation of the Memorial of Dead in Ireland" from 1904 until his death in 1923. After Carton was sold in 1949 Kilkea Castle became the seat of the 8th Duke of Leinster. The castle and estate was sold by the Fitzgerald family in the early 1960s. Kilkea Castle was then run as a hotel for decades, but entered Examinership in 2009, as a result of the Irish financial crisis. It was closed and put up for sale but has since sold.